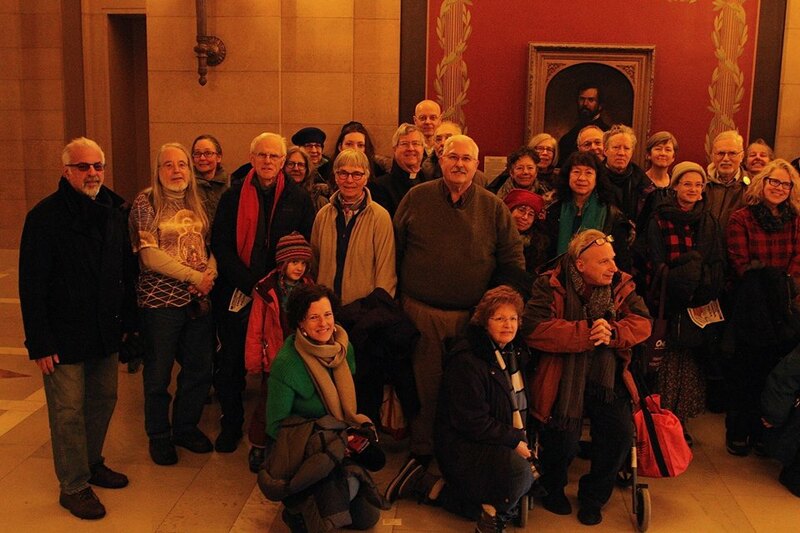 Wisdom teachers from various wisdom traditions -- including the Boundless Love Project's Mindfulness Teacher, Freeman -- gathered in support of water and climate protection in the Minnesota Governor's Conference Room on the morning of February 8, 2019. Despite lows of 10 degrees below freezing and wind chills hitting 30 below, 75 earth protectors attended to voice opposition to the construction of Enbridge Line 3 crude oil pipeline that would run from Edmonton, Alberta to Superior, Wisconsin. Ojibwe elder Sharon Day (far left) leads a traditional water ceremony. The proposed Line 3 pipeline would cross native lands, violate treaty rights, pollute lakes and waterways, and exacerbate the climate crisis by ramping up the use of super-polluting tar sands oil. Climate scientists have repeatedly warned that using tar sands oil means "game over" for global climate health. Previously, 550 wisdom teachers signed a letter to Governor Mark Dayton asking him to stop Line 3 to protect our waters, climate, and the health and safety of future generations. Rev. Rebecca Voelkel from the United Church of Christ. 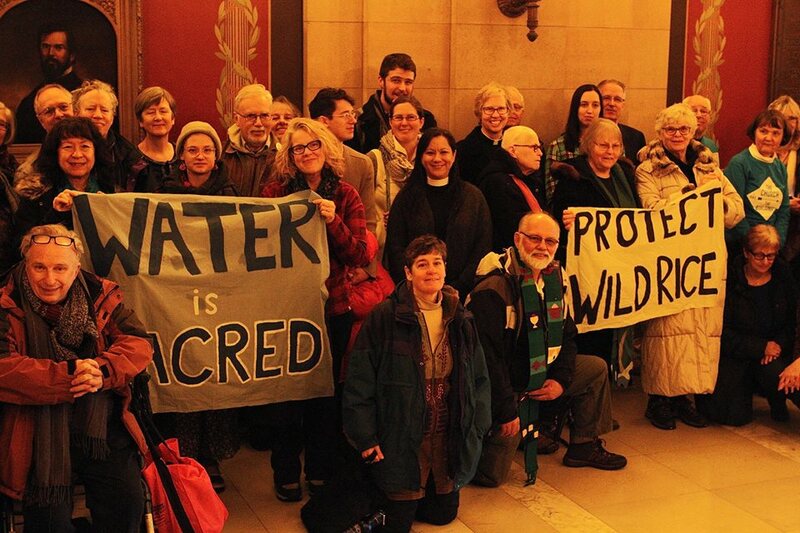 This demonstration -- organized by Minnesota Interfaith Power and Light and co-sponsored by several organizations including the Boundless Love Project -- occurred four days before Governor Tim Walz needed to decide whether to let the Minnesota Department of Commerce (DOC) refile their legal appeal to stop Line 3. The appeal, started under Dayton's administration, had been thrown out on a technicality, with the judge asking for it to be refiled by February 12. Walz faced much pressure from oil interests, labor groups, and republicans to drop the lawsuit, and he made several comments showing sympathy to this idea. Speakers at the event included an Ojibwe elder, Sharon Day, who led the group in a traditional water ceremony; Rev. Rebecca Voelkel, a minister for the United Church of Christ; Rev. Jim Bear Jacobs, member of the Mohican nation; Dana Neuhauser, Minister of Public Witness at New City Church, a United Methodist Church in Minneapolis; Rev. Dr. Curtiss DeYoung, CEO of the Minnesota Council of Churches; and Freeman, the Boundless Love Project's Mindfulness Teacher. Many other wisdom teachers from various traditions were present. The demonstration was peaceful, respectful, calm, and friendly. Mindfulness Teacher Freeman from the Boundless Love Project offers a blessing. The Buddha tells us, "Hatred never ceases by hatred, but by love alone. This is an eternal law." Given that love is what creates positive change, may we boundlessly share our love with all people, all beings, and all life forms, whether animate or inanimate. We offer our love to all of nature. May the climate, water, land, and air be safe, protected, healthy, and life-giving, now and forever. We offer our love to the indigenous people of northern Minnesota who will be harmed by the construction of the line three tar sands pipeline. We acknowledge that Minnesota is home to the Dakota, Anishinabe, and other indigenous peoples who were the original stewards of this land. May our work here today be in solidarity with Native people and their land. May your lakes and lands always be clean, may your wild rice always be healthy and abundant, and may you and your families be safe and protected, healthy and strong, peaceful and happy. Minister of Public Witness at New City Church, Dana Neuhauser, shares inspirational words. We offer our love to the politicians. May all politicians be peaceful and wise and pass legislation that serves all people, all beings, and all life, including the lives of future generations. We offer our love to all who work in the fossil fuel industry. May workers and their families be peaceful, happy, healthy, and wise. May the solutions we collectively implement to protect our climate, our children, and grandchildren, also provide for the workers and their families so that they too may thrive. We offer our love to all who work to protect our climate and planet. May we be loving, courageous, wise, and skillful, that our efforts may be successful and benefit all people, all beings, and all life forms. Rev. Jim Bear Jacobs speaks out. May all water be clean, healthy, and life-giving. May the climate be safe and protected. May all legislators be peaceful and wise. May all workers and their families thrive. We offer our love to the indigenous people and people of northern Minnesota who will be most harmed by the construction of the tar sands pipeline; we offer our love to the water, the land, the sky, and the climate; we offer our love to the politicians, those who work for fossil fuel companies, and all environmental and social justice advocates. May we all be safe and protected, peaceful and happy, healthy and strong. May we all be compassionate, loving, and wise. Rev. Dr. Curtiss DeYoung, CEO of the Minnesota Council of Churches. On Feb. 12, Walz announced the DOC would refile its legal appeal to stop Enbridge's Line 3. To what degree this loving action influenced his decision is unknown, yet it was one factor. Let this remind us that activism has the power to open hearts and minds and protect life. 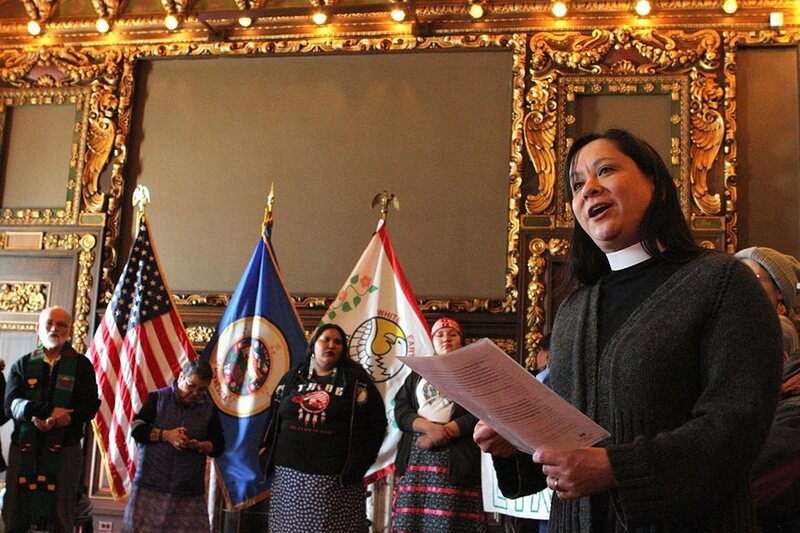 Thanks goes to Healing Minnesota Stories blog article, At Critical Juncture, Faith Leaders Call on Gov. Walz to Stop Enbridge Line 3 and Kaia Svien for some of the info used in this article. Thanks to Minnesota Interfaith Power and Light for the photos.